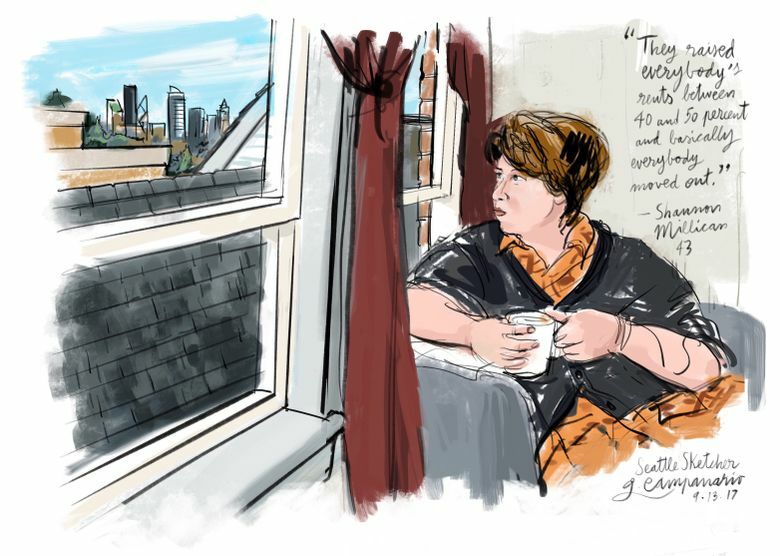 When the building changed hands after her landlord's death, rents began to rise beyond the means of most working-class Seattleites. Seattle renter Shannon Millican, an executive administrative assistant at UW Medical Center, said the Eastlake building where she has lived for seven years used to be owned by a good landlord, Folke Nyberg, a well-known Seattle architect and activist who was a staunch supporter of affordable housing. Seattle is experiencing one of the priciest rental and housing markets in years. If you'd like to be considered as a subject of my illustrated chronicle about Seattle renters, contact me at gcampanario@seattletimes.com. I'd love to hear your story and maybe make some sketches of your apartment before you get priced out. But when the building changed hands after his death, rents began to rise beyond the means of most working-class Seattleites like her. To avoid a jump from $850 to $1,675 for her one-bedroom apartment, Millican downsized to a studio down the hall, where she now pays $1,300 a month. This same studio, which she has artfully decorated with Victorian-style curtains and drapery, rented for $675 back in 2010, she said. The building no longer houses the type of tenants she remembers. Tech workers have replaced students, people in the service industry, baristas, older people on fixed incomes and “your average city worker making $30,000 to 40,000 a year,” Millican said. The city skyline that reminds her of her dad — a Tacoma construction foreman who helped built the Columbia Center back in the 1980s — has also changed during the recent construction boom. It’s a view Millican may not be able to enjoy much longer if rent increases continue to outpace wages. “I feel it’s like my last view of the city,” she said.